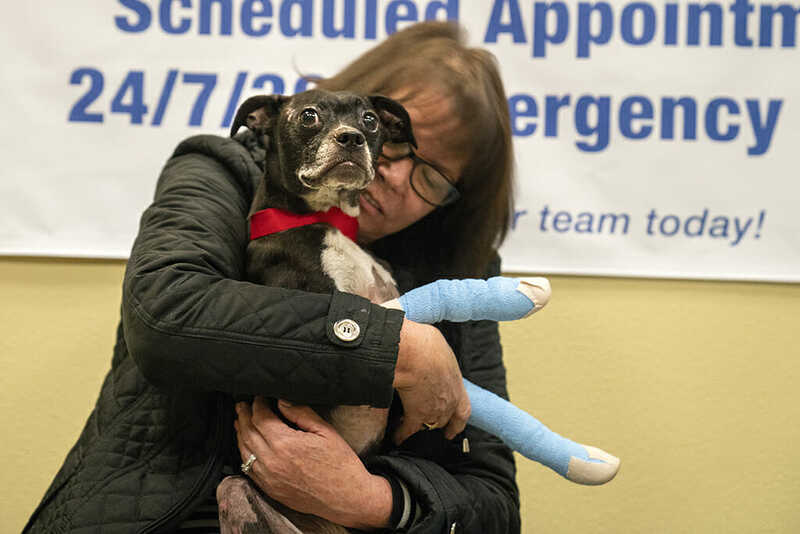 December 5, 2018 – Several burned dogs and cats at the VCA Valley Oak Veterinary Center in Chico are getting an unusual treatment to help them heal from injuries they suffered in the Camp Fire: fish skins. This is the first time sterilized tilapia skins have been used to treat burns on dogs and cats. 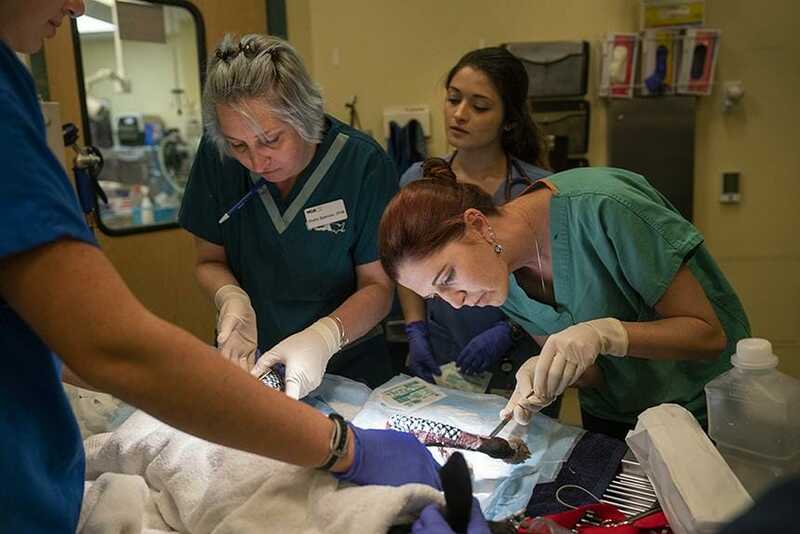 Jamie Peyton, chief of the Integrative Medicine Service with the University of California, Davis, Veterinary Medical Teaching Hospital, volunteered to help VCA Valley Oak veterinarians when she heard about the hundreds of burned animals they were treating. So far, she’s applied the fish skins on the burns of four dogs and four cats. Peyton first used the procedure on two bears and a mountain lion burned in the Thomas Fire in Ventura County in 2017. She also treated a bear cub burned in the Carr Fire this year. 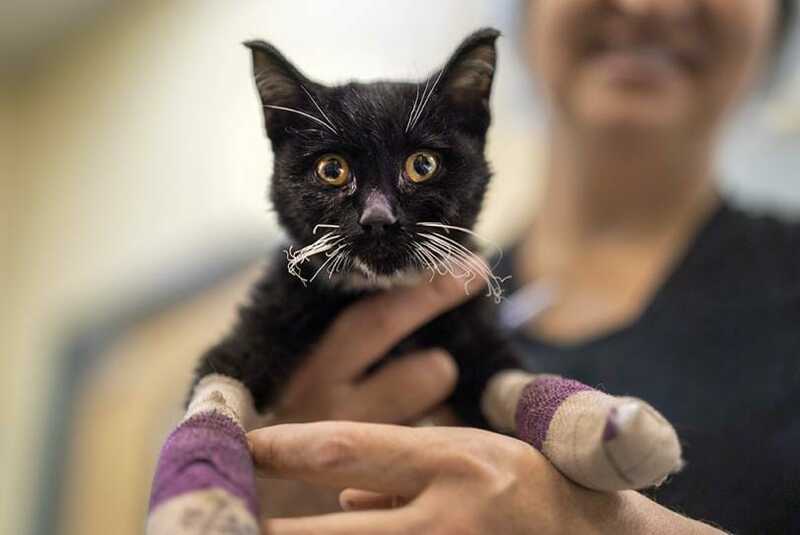 The vast majority of the more than 500 animals VCA Valley Oak has received are cats, said Dusty Spencer, a veterinary surgeon at VCA Valley Oak Veterinary Center. A 4-month-old kitten was brought to the hospital on Nov. 20, having spent 13 days roaming the Camp Fire burn area. He had third-degree burns on some of his paws, and the pads of his feet were gone. “Just like we’ve seen in other species, we’re seeing increased pain relief. We’re seeing wound healing and an overall increased comfort,” said Peyton. A patent application has been filed on this technology. An 8-year-old Boston terrier mix named Olivia was one of the first dogs to be treated. She was found with multiple second-degree burns on her side and legs. Her owners, Curtis and Mindy Stark, were out of town when the Camp Fire started and thought their dog had perished when their home burned down. Fortunately, Olivia had been chipped and was reunited with her owners. VCA Valley Oak veterinarians cleaned Olivia’s wounds, and she was given traditional pain medications. The Starks also agreed to have Olivia treated with tilapia skins. Curtis Stark said before the tilapia treatment Olivia was pretty mopey, but she soon returned to her old self. New skin grew on Olivia’s leg burn within five days. Normally, it can take weeks for skin to grow over severe burns. “We’ve been very impressed and somewhat amazed with the amount of healing that happened underneath those fish skins,” said Spencer. Peyton said there is no established standard of care in the literature for treating animals with burns. “One of the most important things about being at UC Davis VMTH is that we are learning new techniques, but they don’t make much of a difference unless we can use them in the community,” said Peyton. She said the long-term goal is to be able to provide these techniques to other veterinarians, so that more animals can heal.